Originally designed as an Anti-tank vehicles the soft top variant of the BV206 was armed with either a Bofors 90 mm recoilless rifle, a TOW, MILAN or Bofors RBS 56 BILL ATGW located on a central pivot mount which could be hydraulically raised to the required level. The open-front body is provided with roll bars which can be quickly lowered. The low-profile rear body is designed to withstand the back blast of the weapon when it is fired and is used for storing ammunition. Our vehicles have had all elements relating to the weapons systems removed along with the rear body which is replaced with either a cargo body, a personnel carrier body, a drops system or something more bespoke to a customer`s requirements. 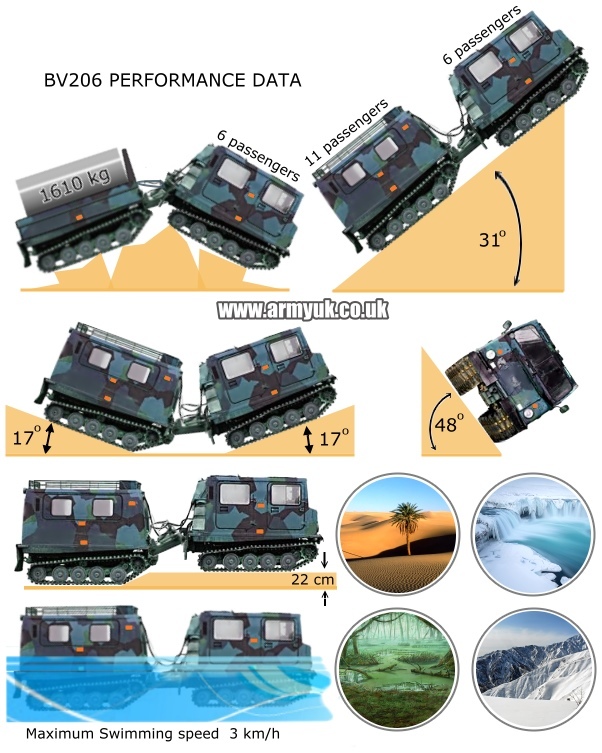 Hagglunds BV 206 is a special military vehicle designed for use as an all-terrain transport vehicle, capable of travel both on and off roads, under almost all conditions and in all extremes climate�s. Its large track area allows the vehicle to travel over deep snow and soft ground which would be impassable to almost all other tracked and wheeled vehicles. Shown left is a DROPS varriant with 3,000kg electric / hydraulic hook lift system. THESE UNITS WILL REQUIRE A FULL EXPORT LICENCE IS SOLD OUTSIDE OF THE U.K.